After much anticipation, everyone’s favorite green plumber will be joining Tamashii Nation’s super articulated action figure line. Welcome S.H.Figuarts Luigi! S.H.Figuarts advanced articulation allows for precise posing to bring the intense video game action to your fingertips. Luigi is perfect for posing with S.H.Figuarts Mario and recreating your favorite gaming scenes. Set features red brick block, a red shell, interchangeable hand parts for holding red shell, shell connecting parts, and special display stand with support arms. Separately sold diorama play sets allow you to expand Luigi’s world. 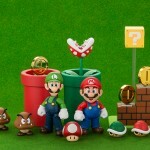 S.H.Figuarts Diorama Play Sets allow you to take full advantage of S.H.Figuarts Mario and S.H.Figuarts Luigi figures. Diorama Play Set C features a variety of option parts to enhance the action figure posing experience. Set includes a red pipe, pipe adjustment parts, Buzzy Beetle, Piranha Plant, coin, and coin stand. We got a chance to see these at SDCC, and here’s another look at them. 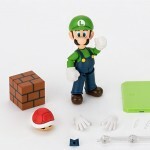 Tamashii has released official photos of their upcoming SH Figuarts Luigi and Super Mario Diorama Set C. Luigi will include a Koopa Trooper shell, additional hands, a brick block and a stand. Super Mario Diorama Set C includes a warp pipe, a swap out top for the pipe, a gold coin, a Buzzy Beetle and a Piranha Plant. These are due out in December in Japan, with a North American release likely not too far behind. You can see the photos by reading on. Here are pics of the Jakks Pacific display from Toy Fair 2014. These have their oversized Star Wars 5 points of articulation figures, some Nintendo toys and a giant TMNT Michelangelo, though not sure if it’s just a display or if that will be released, but it’s massive.